The Asia Superyacht Rendezvous has received many of the world’s finest superyachts over the past 15 years and another superlative gathering, custom-designed for the owners & captains of superyachts, is expected to welcome even more magnificent vessels streaming to ASR 2016. “The elite gathering, held December 16-18 every year, consistently attracts superior sail and power vessels from among the world’s stunning superyachts”, reports ASR long time organisers, Gordon Fernandes & Captain (Champagne) Charlie Dwyer: “Now for the first time the two days of Superyacht Racing will culminate in an ‘Asia Superyacht Rendezvous Cup’ award”. “In addition, for the first time our guests may choose to race or simply enjoy the pleasure of being out on the water during the races, cheering on their favourites”, adds Gordon. Joining the 2016 Rendezvous are an outstanding group of Sponsors & Media Partners, including: Co-Sponsor Benetti Yachts, Co-Sponsor Asia Pacific Superyachts, Host Hotel SALA Resort & Spa Phuket and S/y Dunia Baru along with major Media Partner Lux Media Group and Heart Media, YACHTStyle and Palace magazines; longtime media partner, the Phuket Gazette (distributing ASR stories via Phuket Gazette with12 major airlines); The Nation newspapers; The STC Magazine (Shanghai Travelers’ Club) media group of New York and Hong Kong; Oriental Publishing’s Jetgala Magazine and other global and national yachting media supporting ASR with feature stories and editorial digitally and in print – all ensuring news of this exclusive event reaches throughout Asia and the far corners of the world. This year VIP guests will be whisked away by tenders to celebrate the ‘Opening Night Cocktail Party’ aboard the unique phinisi-style sailing superyacht, Dunia Baru. The following days and evenings offer many opportunities for relaxed socialising amidst the 2 days of highly competitive but friendly sailing races & pleasure cruising. A highlight after the first race on Day 2 is the festive ‘Benetti Challenge’, with yacht teams constructing and racing a small sailboat powered only by a team’s member’s breath sending them down a 10’ long water trough, as friends wildly cheer on their favourites! 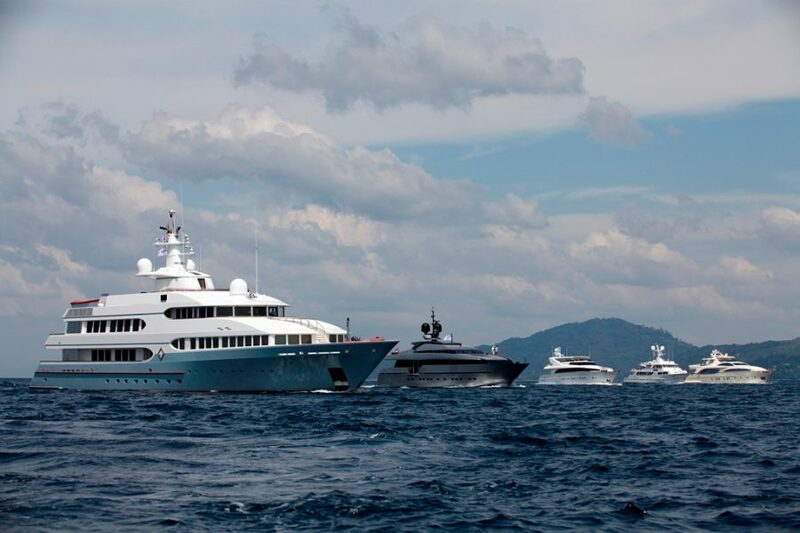 An elite superyacht gathering on land and water, the Asia Superyacht Rendezvous is positioned perfectly between Phuket’s King’s Cup and the Thailand Yacht Show and is a wonderful way for superyacht owners to meet and captains to compare notes, all in a relaxed social setting without any distractions. The event is held in an exclusive, non-commercial environment while providing owners, captains and crews with thrilling superyacht racing with an option to join in or view on the water. To request an invitation (yachts 25m and longer) by emailing Gordon Fernandes.